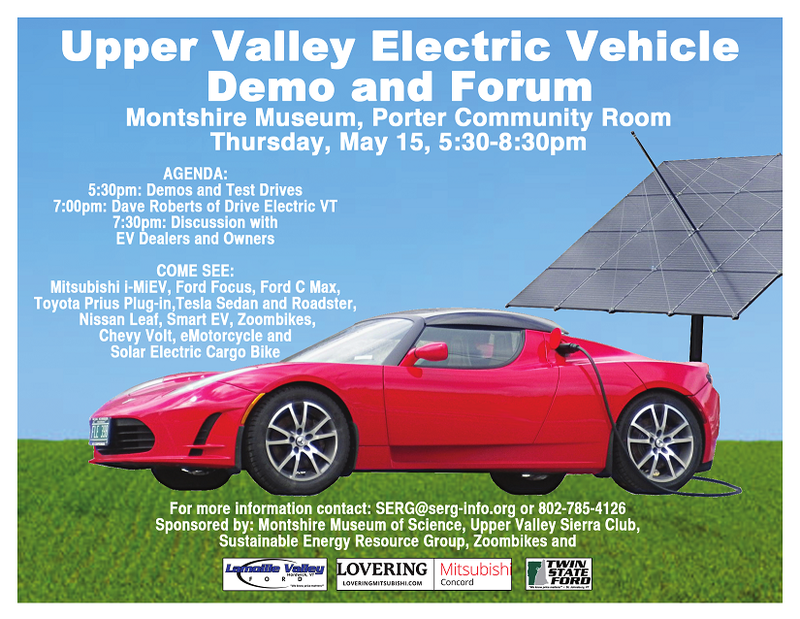 There will be an Upper Valley Electric Vehicle Forum and Demonstration on May 15 at the Montshire Museum in Norwich, VT.
-5:30 to 7 pm- Car viewing, and talking with owners and dealers outside. 7 of the owners have offered to give test rides, and the dealers may also allow some test drives, Vehicles on display will include Mitsubishi i-MiEV, Ford Focus, Ford C-Max, Toyota Prius Plug-in, Tesla Sedan and Roadster, Nissan Leaf, Smart EV, Chevy Volt, Dartmouth Formula Racing electric race car, Mt Washington 2013 Summit Electric Motorcycle, Zoombikes Electric Bikes, and a Solar Electric Cargo Bicycle. -7 to 7:30 pm- Dave Roberts of Drive Electric Vermont will give a presentation indoors about Electric Vehicles in Vermont. -7:30 to 8:15 pm- Discussion with Dave Roberts, sponsors, car owners, and audience questions and answers. Displays inside will also include Voltrek Public Charging Stations, Charging your vehicle with a solar array by Enfield Energy Emporium, and the Mt Washington ALT Energy Summit. Free and open to everyone, if you have questions about electric vehicles this will be a good event to attend. Sponsored by the Upper Valley Sierra Club, Sustainable Energy Resource Group, Montshire Museum of Science, Zoombikes, Lamoille Valley Ford Hardwick, Lovering Mitsubishi Concord, and Twin State Ford in St Johnsbury. I've organized this for the Upper Valley Sierra Club, along with cosponsor Bob Walker of SERG. It was relatively easy, as I had already talked to many of the participants last summer while out with the Bakfiets. There are a couple of neat things about this event. First- both a racing electric motorcycle (from the Mt Washington ALT Energy Summit) and a racing formula car (from the Dartmouth college team) will be present (not to say that my solar electric cargo bike isn't worth the trip all by itself...) Second- 7 of the owners have volunteered to give test rides, they are into it! (there will also be test rides on the Bakfiets.) There is going to be a lot of expertise here, if you are in the area it should be very interesting. A little over 100 people attended, and afterwards half a dozen came up to me and said what a great presentation it was. 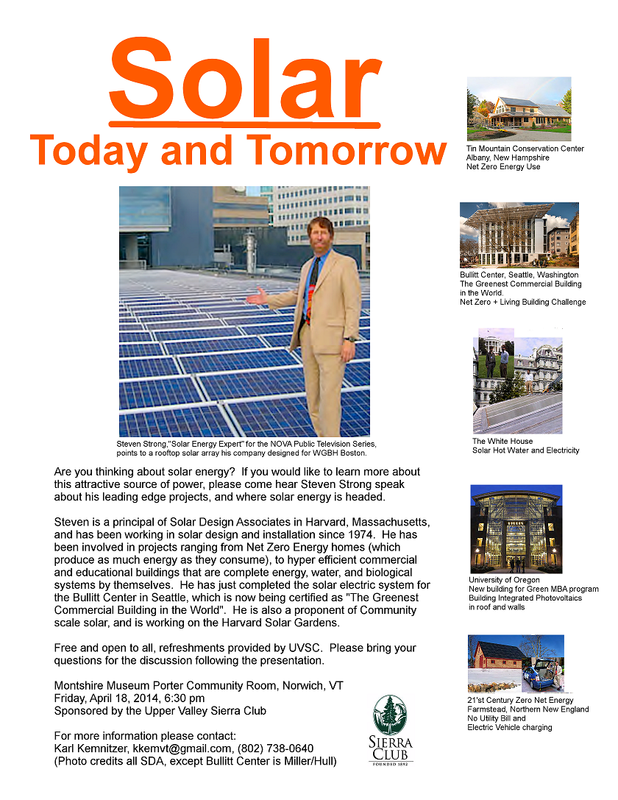 He went through a long list of projects, many of which were firsts, and added some commentary about what solar can do. Other than drilling for fossil fuels, the U.S. doesn't have an energy policy, and he included a video by Bill Maher that quoted half a dozen presidents from both parties saying that "Energy Independence" was a national priority. I feel that Steven did me a big favor by agreeing to speak, and would like to take this chance to say thanks. Several people attended who I have done solar site assessments for, and I think Steven's presentation helped bring solar power out of their future thinking into something they can do now. As the banking community also starts to understand solar better it is starting to change from a high risk loan category (with high rates), into something that is more dependable and stable than projects based on oil. If people like Steven continue to help educate us about solar, there should be some good changes coming along. "The high efficiency of bicycles allows solar to directly provide a significant portion of their propulsion energy, giving a longer range, larger load capacity, and accessibility to more riders. Three electrically assisted cargo bikes are being built for long term energy monitoring and user trials. The first bike is a Bakfiets type frame with a geared hub motor and 60 watts of solar, the second bike is a longtail frame with a direct drive motor, regenerative braking, and 100 watts of solar with a mobile solar controller, and the third bike will have a mid drive motor and 200 watts of solar built into a simple bodywork with 48 volt microinverters. Data is being collected on drivetrain efficiencies, power production and usage, roadway shading, bodywork, and driving patterns. Last year the Bakfiets used 13.2 Wh per mile (equivalent to 2553 mpg), at an average speed of 14.9 mph and a range of 64 miles. The average motor load was 199 watts, and depending on terrain solar power provided about 25% of the energy needed. 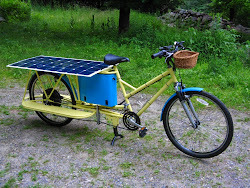 The third bike should approach enclosed Ultra Light Vehicle usefulness while requiring less energy, be well designed for Vermont road topography, and get more than half of it's power from the sun." I'll be going down for just the parade and bicycle petting zoo on June 7. This trip was instigated by Dave Cohen, a fellow cargo bike enthusiast and ecopsychologist. He feels that cars disconnect us from our environment, (they do), and has convinced Burrows bike shop to sell Yuba cargo bikes as an antidote. He is also working to bring some ELF enclosed bikes to his town. I am not keen on the ELF for reasons I'll explain in the fourth post on bicycle bodywork, but for Dave's purposes it could be very good. Brattleboro has old streets, many are narrow, and a large bike like the ELF has to take the lane. This should promote some serious discussion about bike infrastructure, and Brattleboro is a good place to have this discussion. 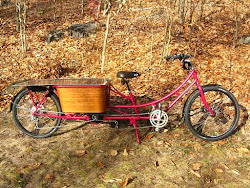 Dave has also been working with state rep Molly Burke, and he has been appointed "Cargo Bike Expert" to the Go Vermont! commuting program. He would like to set up a loan program of several cargo bikes for towns and other bike shops, and I may help with the technical (electrical/mechanical) part. I hope he gets some funding. Liz Canning has reached her goal of $40,000 on her "Less Car More Go" cargo bike film Kickstarter campaign.. It has spread pretty far, I started getting notices about the film campaign from European bike blogs. She is now trying to meet matching dollar challenges in the last couple of days of the drive. Power to the Pedals: Wenzday Jane and the Culture of Change Trailer from Heather Merrill on Vimeo. Wenzday's movie seems like one of empowerment, while Liz's movie is crowd sourced, and has stories from many riders. I've seen parts of Liz's movie already, and it explains cargo bikes, but also is a lot of fun. I'm hoping to see Wenzday's movie soon, as I can relate to building bikes. "pay quick, ask no questions, deal with what you end up with, expect the worst..hope for the best. typical buy from china method." It seems that assemblies like batteries fare worse, and components like cells can be bought with less trouble. To me it seems like buying from an Odd Lots store- you can find very good deals but you have to take what ever is the surplus of the moment, because the battery you buy from China is the product of a one time contract, not a supply chain. Since the two batteries are the same size, they will fit in the same size battery box, which will make comparing battery and bicycle performance easier. I've put together the top, bottom and sides of the box, and am working on inner partitions. Pictures coming up!